With the holiday season upon us, we find ourselves in a time of reflection of past, present and future. We gather with loved ones to give thanks for the blessings our lives have brought us. We celebrate living in the moment with festivals of light and giving, and we dedicate ourselves to renewal and hope with the promises of a new year and a bright future. As you reflect on your own blessings and visions for the future, we thank you for your support of ACEMM. With the holidays upon us, we find ourselves in a time of reflection of past, present and future. We gather with loved ones to give thanks for the blessings our lives have brought us. We celebrate living in the moment with festivals of light and giving, and we dedicate ourselves to renewal and hope with the promises of a new year and a bright future. In advance of #GivingTuesday, we wanted to share thoughts on why ACEMM matters from members of the ACEMM Community. As you reflect on your own blessings and visions for the future, we thank you for your support of ACEMM. Help ACEMM “Spark” new possibilities for elemental music and movement by adding your voice to our supporters on #GivingTuesday, November 27. We create the opportunities, YOU make the difference! We at ACEMM are thankful for all of our supporters! 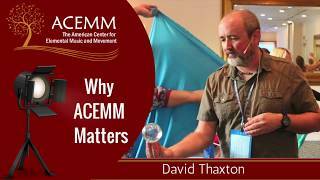 Over the past six years, ACEMM has launched many philanthropic and supportive initiatives, including Beacon Scholarships, Spotlight Awards, Mobile Ensembles, Travel Grants for Elemental Ensembles and now, a brand new program joins the ranks. ACEMM is proud to offer Spark Grants! You may have seen one of our posts on Facebook, or visited our booth at the AOSA National Conference this week in Cincinnati. Perhaps you know a teaching colleague who was featured in our Spotlight Awards. But do you know who ACEMM is? Come See ACEMM in Cincinnati at the AOSA Conference! We know you love ACEMM as much as we do! Stop by the ACEMM booth, snap a photo, and share a few thoughts on why #iloveACEMM. The exhibit hall’s grand opening is at 5:30 on Thursday, stop by then at our booth, say hello, and pick up a newly designed set of ACEMM building block rhythm cards! No tricks! You’ve been a treat for ACEMM all the year through! We wanted to reach out to you and say thanks for being a member of our community, and for the support so many have shown for our mission to promote the possibilities of elemental music and movement at the local, regional and national level. Our latest short post shares a few of the great treats ACEMM is able to share because of you! Essel Linton is ACEMM’s Fall 2018 Spotlight Recipient! Congratulations to Essel Linton, ACEMM’s Fall 2018 Spotlight Award recipient! A veteran music educator, Essel’s unique background influences her teaching while addressing student needs at a school where for many, English is not a first language. Read on to find out more about the ways her dedication and teaching approach benefits young learners and colleagues!